Create rules that put you in charge of your personal credit. Start by settling what you can as part of the divorce agreement. Ideally, the divorce proceeding will divide everything up, so there are no more shared credit issues. If there are, take charge of what remains such as mortgage. 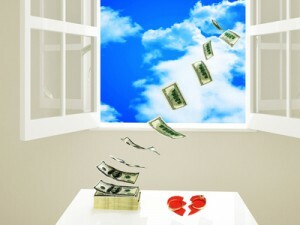 Finance site Bankrate.com points out that home lenders consider you married, whether divorced or not. The best solution is to refinance the home and pay off your spouse or sell the property. If you choose to keep the house in both names, take responsibility for making the mortgage payments and ask your spouse to pay you directly to avoid late charges that affect your credit score. Closing low-balance credit card accounts obtained during your marriage may initially cause your credit score to drop, according to FICO, especially if the debt remains the same. For example, if you owe nothing on three cards and close them, you have fewer cards but the same amount of debt. Keep unused accounts open, but ask to have them put in your name. If the debt on a joint account is solely your spouse’s responsibility, make taking your name off the account part of the divorce agreement. Ask lenders to freeze credit accounts with balances to keep either party from using them until they can be paid off and closed. Revert to your maiden name after the divorce. This creates a timeline for separating credit issues and allows you to establish your own post-marriage identity. Making this change protects you from spousal sabotage if things should get ugly. Change all your personal accounts (or open new ones) to that name, as well. Make sure to adjust your passwords on everything from your computer network to your ATM to protect your new identity. Hiring a credit monitoring service such as Lifelock will alert you to any changes, too and protect your identity. The Federal Trade Commission notes you are entitled to a free copy of your credit report every twelve months from AnnualCreditReport.com. Credit reporting agencies are not going to remove accurate information, whether it was your spouse’s fault or not. You can ask, however, for an investigation into anything posted after the divorce or anything that seems improper. Go through the reports and identify joint debts prior to the signing the agreement to resolve them. Make sure all debts your spouse is responsible for are in just the one name, too. Analyzing your credit score once a year gives you perspective as you work to improve it and move forward with your new life.